Test it now, go do the download page and build it to your custom needs, install the full suite or just download our easy to use installer. Test it now, go do the demo page to see it in action. Fork us on github. Or just report an issue. 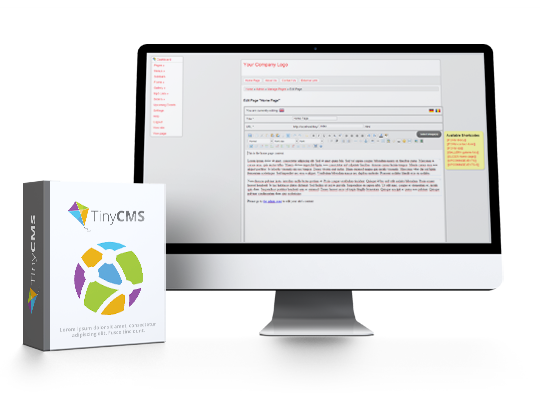 TinyCMS is not a platform that supports thousands of pages, not because it can’t do it but because it would use to many files and resources to be called “tiny”. Template-able – you can have multiple website templates, easily changeable with one click. The system will use ten times less memory as WordPress for example to achieve the same result. In some cases it can be one hundred times as fast to render a page on the exact same setup as a giant like WordPress or Joomla. That’s because, for this purpose, you will only ever use a maximum of 1% of what these giants can do with their code. The cms is using a short-code system that will allow you to completely separate php coding from html coding, thus you will have a html file that you can use to “draw” your website without having to bother about the way the “engine” works. It has a page and menus system that will allow you to separate the menus form the pages enabling you to achieve your project exact specifications. © 2018 TinyCMS. All rights reserved.